I really wished to avoid joining the pig pile of derision that has fallen on SF Opera’s premiere of John Adams and Peter Sellars’ Girls of the Golden West. And I think, in a sense, that I can. Given the libretto that it had to work with, both John Adams’ composition and the SF Opera’s production did about as much as humanly possible to rescue this train-wreck of a dramatic piece from itself. But, unfortunately, they came up slightly short. Before going into the redemptive aspects of the performance (on which I plan to spend most of this review), it deserves mention that San Francisco Chronicle reviewer Joshua Kosman was absolutely right in his diagnosis of Girls’ weaknesses as a dramatic piece. The materials of Peter Sellars’ libretto – a series of reflections on California life from the letters of East Coast Gold Rush transplant Louise Clapp (“Dame Shirley”), are simply not the stuff of opera. This situation was exacerbated by Sellars’ ill-advised attempts to fill the holes created by the letters (and to solve the problem of having Dame Shirley’s words appear not only on her own lips but on everyone else’s as well) by adding a series of excerpts from such incongruous sources as Lorca, Twain, Frederick Douglass, and Shakespeare. Taken together, this composite libretto supplied little drama, even less plot, and an endless supply of inane observations that seemed to lead nowhere and to have little relation to one another. It was a libretto that put composer John Adams behind the eight ball before he had even written a note. Sellers and Adams often stated in the lead-up to Girls that they were seeking to create an opera grounded in California – a homegrown portrait of the messy but vibrant era in which today’s California finds its roots. Unfortunately, few non-self-loathing Californians will recognize their origins in this opera. 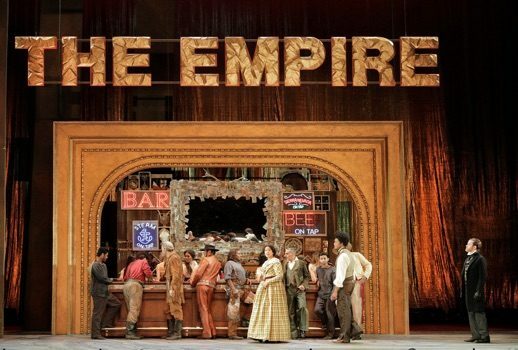 Far from asking tough questions by showing the Gold Rush as it was – tumultuous, hard-edged, optimistic, sometimes brutal – Girls ended up just as cartoonish as the Puccini rendering it sought to update. Adams and Sellars’ version offers us a dystopian morality play, a vision of the Wild West seen through the eyes of 21st century Berkeleyites. On one side of the stage (often literally) is the debauched and diabolical lynch mob of miners, all its non-gold-prospecting hours spent drinking, gambling, and finding foreigners to beat up. On the other side are a diverse cast of woman and minority characters, huddled together for comfort against the pitiless onslaught, which reaches its bitter climax in the execution of Josefa Segovia – the only woman ever hanged in the state of California. There is even an onstage replica of the giant felled tree stump from Calaveras Big Trees State Park for the second act, which the miners dance and pace over with all the subtle symbolism of a Bugs Bunny short. Just in case you forgot, not only were the miners all rapacious nativists: they hated the earth, too! But the low-hanging fruit of the opera’s cartoonish landscape has already been well-harvested by other critics, as has the inappropriateness of its incongruous non-narrative plot. Perhaps a more useful question to ask at this point is: given these faulty dramatic materials, how good a job did Adams in his scoring and the SF Opera in its production do of redeeming them? There is far more positive to say on that front. John Adams’ score for Girls of the Golden West may not have the complexity of orchestral layering we find in Nixon in China, but it does manage to achieve a significant level of dramatic variation, orchestrational tone-painting, and occasional moments of poignant tenderness. The overall sound environment of the opera (in Adams or other minimalists there is nearly always an overriding aesthetic) was that of Copland’s Americana viewed through a sort of funhouse mirror. This musical mirror twisted airy open fifths into tritones, octaves into stinging sevenths and ninths, and intuitive rhythmic emphases into Stravinskian gut-punches, while distorting regular meters into irregular ones. This approach was often quite successful. One particular example is the “Spider Dance” performed by Lorena Feijóo as Lola Montez, a burlesque number in which she gradually hikes up her skirts farther and farther under the pretext of a spider infestation in her nether regions. For this dance, Adams makes excellent use of timbral variety in the orchestra to build tension, combining mischievous chromatic scales in the clarinets and bassoons with violin trills. In the ultimate gesture of Lutoslawski-worthy cheekiness, he pulls the orchestrational rug out at the very end of this striptease, leaving the high woodwinds hanging in the air. While the Spider Dance may represent the climax of Adams’ achievement within the prevailing aesthetic of the opera, the moments of respite he offers us from the austere environment are more poignant. These include Dame Shirley’s Act I reverie as she admires the beauty of a group of Native American girls on her wagon journey to the mines, and especially includes her epilogue to the opera, a meditative ode to the open California landscape over an accompaniment built on fifths and ninths. Given a rare opportunity to show some warmth for his California home, Adams took full advantage. Though it seemed somewhat incompatible in its musical language with the rest of the opera, so was its text – what’s a poor composer to do? There were several other brilliant examples of Adam’s musical descriptiveness, and his abilities to use orchestration to mirror the action on stage. There was, for example, his use of snap or “Bartok” pizzicato in the strings to amplify the incisiveness of a scene where the miners’ mob clubs a group of Chilean laborers; the careening drunk music for lead miner Joe Cannon (Paul Appleby); or the titanic accompaniment to Ned Peters (Davóne Tines’) deeply affecting aria on a speech of Frederick Douglass. Despite the (mostly rhythmic) challenges of Adams’ score, the SF Opera Orchestra found a sure-handed leader in conductor Grant Gershon. Though it was clear from his gestures that his primary preoccupation in performance was keeping everyone on the rails, he achieved this marvelously, providing all necessary information efficiently to the stage, and allowing expressive playing to arise organically from the orchestra. Ian Robertson was masterful as ever in his preparation of the men of the SF Opera Chorus (which formed the core of the miners’ mob). Given a series of screaming Orff-like barbarities to sing based on recompositions of traditional mining songs, Robertson supplied exactly the gruff tone and crystal-clear diction Adams called for. The cast assembled for Girls of the Golden West was excellent overall, and frequently rescued the plodding narrative with sheer vocal artistry. Even better was the performance by baritone Tines in the role of Ned Peters, a freed slave turned stagecoach driver who forms a close relationship with Dame Shirley. In an acting role that runs the gamut from the submissiveness of the driver to the defiant power of Frederick Douglass’ “What to the slave is the Fourth of July?” Tines showed an extraordinary nuance of presentation. In the latter aria, Tines powerfully embodied centuries of fury as his silhouette was projected garishly onto the severed tree stump behind him. Though the aria made little sense in the larger context of Girls (as can be said of so many things in this opera), as a standalone piece it had the deep impact of a work written by an observant composer just for Tines’ voice. Perhaps the aria could have a successful future life as a concert piece. In the lead villain role of Joe Cannon, tenor Appleby played an effective caricature of the drunken, mercurial, and insatiably hedonistic miner. Unfortunately the musical character of Joe was as one-dimensional as his dramatic character, giving us little to evaluate. As an actor, however, he showed considerable ability, even managing to infuse some of his interactions with Chinese prostitute Ah Sing (Hye Jung Lee) with a bit of the genuine human warmth that his hot-blooded character so desperately needed. Bass-baritone Ryan McKinny, cast as fellow miner Clarence, gave an energetic performance, setting the opera’s rugged atmosphere from the opening prologue with a passage from Mark Twain’s Roughing It. Lee in the role of Ah Sing – Joe’s lover and a prostitute with aspirations of escaping to a life of respectability – delivered a sweet, contained performance. Despite a soft whistle-like tone and some troubles controlling her vibrato in the upper range, she exhibited a great deal of vocal agility and a warmth with which the audience could comfortably relate. The opera’s only real vocal disappointments were J’Nai Bridges as Josefa Segovia and Elliot Madore in the role of her partner Ramón. Though the ineffectiveness of their roles may have been partly a function of the protracted periods they spent loitering nervously at the side of the stage (often accompanied by Ned), their vocal performances were largely unremarkable. While Madore’s tone was warm, he had difficulty making his voice carry at lower, more intimate dynamics. For Bridges, her weakness was more a function of lack of personality and variety in her interpretation of the role – a lack which became especially glaring with the awareness that her hanging constituted the climax of the entire opera. For the most part, the staging of Girls of the Golden West supported the flawed anti-narrative at the opera’s core. Scenery was sparse, with disembodied taverns or living rooms lowered by pulley and rope onto the stage during set changes in full view of the audience. While the vignette-like scenes of Act 1 seemed to coalesce out of the ether of memory, the stage scenery mirrored that sense. When in Act 2 the vignettes merged into a more continuous dark tableaux of whippings, clubbings, and stabbings, the scenery changed to match. Harsh red and blue lighting highlighted the farce of the Fourth of July celebration happening on stage, while piped-in angry mob sound-effects attempted to build a menacing atmosphere. All of this, of course, occurred before (and on top of) our enduring symbol of the miners’ callousness, the omnipresent tree stump. Well, at least when it comes to pounding home his message, no one can accuse Peter Sellars of inconsistency!